Posted July 6, 2016 by patrycja & filed under Assisted Living Jobs, Become a Caregiver or CNA, Caregiver CNA Duties, Caregiver Job, Caregiver Resources, Caregiver Training, CNA Job, Home Health Aide Job. Happy Wednesday! Patti here with an exciting update on a recent scholarship recipient, Nicholas G. Avid CNA School awarded Nicholas a full scholarship to become a certified nursing assistant in late May. After five weeks of hard work Nicholas is now finished with his CNA classes and is preparing to take the CNA exam. Located in Streamwood, IL Avid CNA School awards scholarships to two students a year through the myCNAjobs Scholarship Fund. Nicholas received his scholarship along with Markita T. who started the program around the same time as him. When catching up with Nicholas he mentioned that the CNA program at Avid was very well structured and he was able to apply what he learned within the class to his clinical experience. He expressed that not only was the program very educational but it moved in a good pace making it a good fit for anyone who is looking to quickly finish their CNA course. “I would just like to thank myCNAjobs for awarding me this scholarship it really means a lot. They are a wonderful company. The class was a great experience and I feel extremely prepared to step into the working environment as a CNA” raved Nicholas. Once Nicholas received his CNA certification he hopes to work in homecare,assisted living,nursing home in order to get the proper training. He then hopes to move into a permanent job at a hospital. Nicholas believes that his passion for medicine and helping others is what makes him enjoy being a CNA so much. Everyone here at myCNAjobs is so proud of you and we are all excited to see where you take your education. Good luck on your state exam Nicholas! Posted July 5, 2016 by patrycja & filed under Become a Caregiver or CNA, Caregiver CNA Duties, Caregiver Job, Caregiver Resources, Caregiver Training, CNA Job, Home Health Aide Job, Working as Caregiver CNA. Hey all! What better day than today to share some great news about a recent CNA Scholarship recipient. Linda L. started classes in late May at Premier Choice Health Services and has now successfully completed her CNA certification. Linda was so outstanding during her training to become a certified nursing assistant that on the second day of her clinicals she was offered a job at the a long care facility nursing home and will be starting immediately after graduation! About 40 years ago Linda worked in a mental institution where she was CNA. While studying to be a CNA, Linda has noticed how much the medical field has changed. “Healthcare is a lot more caring now” she says, “it focuses on what the patients want and need and this change is why I came back into the field”. The change in the medical field wasn’t the only inspiration for Linda. Her family has always led her to believe that having a job as a CNA meant that she would go to work and treat patients as if they were her family. Taking care of both her mom and her dad has given her the opportunity to see that families rely on CNA’s to give the proper treatment to those whom they love. Linda’s instructor Eric Eric Ahiekpor describes Linda as a “hardworking,dedicated and mature student”. She hopes to train as a CNA and then continue her education and become a licensed practical nurse(LPN). She then hopes to brighten the days of those in hospice care. She has recommended the myCNAjobs Scholarship Fund to all those attending Premier Choice Health Services and hopes to have others that she knows come through our program. Linda our whole team here at myCNAjobs is extremely proud of you and all that you have accomplished. Individuals like you are the reason we do what we do. Like this article? You may also like our recent blog post on: Deserving Caregivers Receive the Opportunity of a Lifetime – Thanks ABC CNA Training Center! Posted June 27, 2016 by patrycja & filed under Become a Caregiver or CNA, Caregiver CNA Duties, Caregiver Job, Caregiver Resources, Caregiver Training, CNA Job, Uncategorized, Working as Caregiver CNA. Hey everyone! Patti here again with some more wonderful news! We’re excited to announce that Quality CNA/CMA Classes has not only awarded their second scholarship but they have become continuous partners with myCNAjobs. They will be giving away one scholarship every other month! This month the scholarship was awarded to the wonderful Elissa C.
Elissa has always had the passion for healthcare and medicine. When she was a little girl she would always be interested in the books her great-grandfather would bring home. She would constantly flip through the books studying the words and pictures. Elissa believes that the ability to work as a CNA will give her “the opportunity to gain more experience, to bond with patients and make a big impact on the lives of others”. Eventually Elissa hopes to become a surgeon but she wants to start from the basics because she believes that is the only way she will be able to appreciate what she does. She hopes to not only be able to represent herself in the field but to represent Quality CNA/CMA as well as myCNAjobs. Quality CNA/CMA is located in Omaha,NE and has a very prestigious CNA/CMA program. They previously awarded their scholarship to Kiley Goodman who completed the program in the spring. The full-tuition free scholarship awarded will now be awarded every other month. With this opportunity we are able to send more caregivers like Kiley and Elissa to school. Thank you Quality CNA/CMA for your partnership! To apply for the myCNAjobs scholarship program, you can fill out an application here. Otherwise, check out more news about our other scholarship winners. Posted by patrycja & filed under Assisted Living Jobs, Become a Caregiver or CNA, Caregiver CNA Duties, Caregiver Job, Caregiver Training, CNA Job, Working as Caregiver CNA. Posted June 20, 2016 by patrycja & filed under Assisted Living Jobs, Become a Caregiver or CNA, Caregiver CNA Duties, Caregiver Job, Caregiver Resources, Caregiver Training, CNA Job, CNA School, Home Health Aide Job, Nursing Job, Working as Caregiver CNA. Hi everyone, Patti here to share some exciting news with you! ABC CNA Training Center awarded their second CNA Scholarship for their June enrollment period. The myCNAjobs Scholarship Team is thrilled to welcome Terrell H. from Queens,NY and Audrey S. from New York, NY to our program. Terrell H. applied not too long before his outstanding application was noticed by our Scholarship Team. After speaking to Terrell and realizing his eagerness to change his life I knew we had to award him the scholarship. Terrell has always had an interest in the healthcare field. Ever since high school he has been taking caregiver courses that will ultimately lead him to his dream of being a registered nurse. Terrell is also a youth, health and wellbeing advocate in his community. Not only is healthcare a big part of his life but he is also very passionate about it. Hearing that he received this scholarship, Terrell was overjoyed and ready to finally have a place to begin his career in healthcare. Audrey S. impressed our Scholarship Team with her story. Audrey has had extensive training in the caregiver field, she took care of her mother for about five years during which she realized that caregiving was her calling. She learned how to administer shots and properly make her mother as comfortable as possible. She hopes to one day be able to make a difference in people’s lives along with bringing pride to ABC Training Center. Her ability to be patient and caring made her the perfect candidate for this scholarship. Audrey has expressed her gratitude for this opportunity to both ABC Training Center and MyCNAjobs. Both Terrell and Audrey will be starting the CNA training program on June 27th! The staff at ABC Training Center is very excited to have two more caregivers join their program. Our team here at myCNAjobs believes it is extremely rewarding to see such passionate individuals finally fulfilling their dreams and seeing them make an impact on the healthcare community. We cannot wait to see how many lives Terrell and Audrey can change and how great they will do in this program. Once they finish training we will also help them find a job. How exciting right? Stay tuned for more on Terrell’s and Audrey’s great stories and how classes are going for them! Check out other myCNAjobs Scholarship Stories! We Asked, You Answered! The 2016 Caregiver Choice Award Results are In! Posted May 27, 2016 by kelley & filed under Assisted Living Jobs, Become a Caregiver or CNA, BrightStar Care, Caregiver CNA Duties, Caregiver Job, Caregiver Job Tip, Caregiver Resources, CNA Job, Contest, Home Health Aide Job, Live In Caregiver, Nursing Job, Working as Caregiver CNA. It’s that time again! myCNAjobs is excited to announce the 2016 Caregiver Choice Awards. myCNAjobs wanted to hear from all of you caregivers, certified nursing assistants, and home health aides on the frontline, to get your feedback on which assisted living and home health agencies are the best places to work in the healthcare field. We would love to hear your feedback! If you have worked as a caregiver or are interested in working as a caregiver, CNA, or HHA in one of the Caregiver Choice ‘Best Places to Work’, please let us know! Oh, and keep up the good work, caregivers; myCNAjobs appreciates all of the great care you provide. Posted by chanelle & filed under Assisted Living Jobs, Become a Caregiver or CNA, Caregiver CNA Duties, caregiver cna interview, Caregiver Job, Caregiver Training, CNA Job, CNA School, Working as Caregiver CNA. Happy Friday! Chanelle here ready to share some exciting news! I was able to catch up with one of our most aspiring scholarship recipients, Kiley G. about her experience at Quality CNA/CMA Class’s CNA program. Based out of Omaha, NE Quality CNA/CMA Classes offered a full-tuition free scholarship to Kiley to attend their spring 2016 CNA class schedule. When I spoke with Kiley, she expressed how grateful she was to be given this opportunity. She continued to tell me, ‘the classes were very interesting and feels like she is learned a lot.’ Kiley recently completed the required 76 hour program, which included on-site instruction, training and testing with flying colors. That sounds like a ton of information and training done within such a short time! Way to go Kiley! Chad Seim, Program Director of Quality CNA/CMA Classes, was thrilled to have such a young and inspiring student apart of their program. He believes that Kiley is set out on the right path to make a difference in our healthcare industry. Us here at myCNAjobs couldn’t agree more with Chad. Kiley continued the phone call by explaining to me that her favorite part about the program was being able to practice real life situations on the mannequins in class. She was taught by a fantastic instructor who always presented positive energy towards the 40 person class. Kiley added that she now hopes to find a job in a local Omaha hospital to gain more experience as she furthers her education. myCNAjobs is very proud of Kiley for being so motivated and making an impact within the Omaha healthcare community. Doesn’t she look awesome in her myCNAjobs branded scrubs? We can’t wait to see all that you will do in your future, remember this is only the beginning of a very exciting journey. Kiley finished the conversation by mentioning that she would recommend Quality CNA/CMA program to anyone looking to become a certified nursing assistant. She even said that she will be attending the school’s medical aid class this July! Posted May 20, 2016 by maggie-thompson & filed under Become a Caregiver or CNA, Caregiver Job, Caregiver Training, CNA School, Home Health Aide Job, Working as Caregiver CNA. Are you passionate about caregiving? Do you want to further your education? Is there a specific sector of healthcare that most interests you? If you answered yes to all three of these questions, myCNAjobs encourages you to apply on our Scholarship Page for the chance to receive a tuition-free CNA Scholarship. Hi all, it’s Maggie here from the scholarship team and we have had another scholarship recipient go through a STNA training program in Columbus, OH. Qurshira B. just finished up her two week course at Larock Healthcare Academy and I had the chance to talk with her after the first week of the program to touch base. Qurshira loves working in healthcare and enjoys helping others who are unable to help themselves. Qurshira has been employed in this industry for several years but thought it was time to continue her education by going through a STNA program. After she passes the state exam and gains more experience, Qurshira has a strong aspiration to get into medical billing. Larock Healthcare Academy provides their students with great instructors who want to see their students succeed. Qurshira and her 11 other classmates have had two weeks packed with learning new material in addition to their clinical, which provides a more hands-on experience. Larock’s two-week course has ended and their next one will be starting in June. Qurshira, we are very happy that you enjoyed your time at Larock and are excited to see what your future has in store for you. MyCNAjobs wishes you the best of luck on your state exam! Monthly scholarships will be given for those who are interested in going through a STNA course in Columbus, OH. We encourage you to apply for a myCNAjobs Scholarship and to research Larock Healthcare Academy. 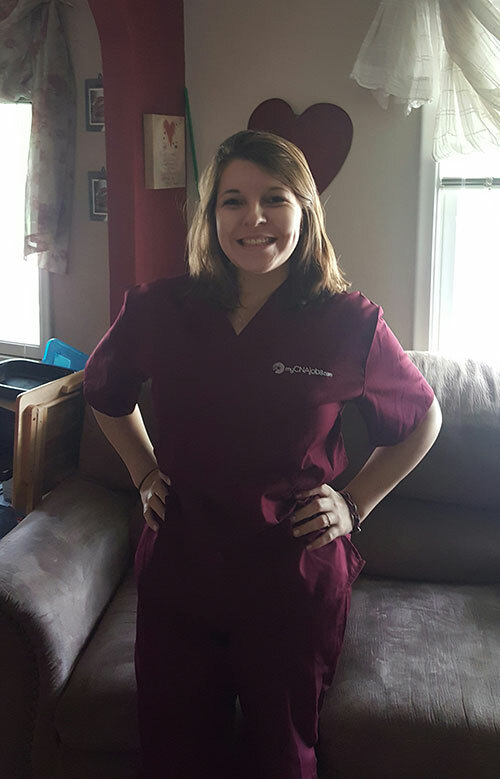 Hi everyone, it is Maggie here to share with you our newest scholarship recipient, Robertha P., who is already half way done with CNA training at Larock Healthcare Academy. Recently, Robertha decided she wanted to go to a CNA school and began to research Larock Healthcare’s program. Well, luckily for Robertha, she ended up being awarded a CNA tuition-free scholarship from the myCNAjobs team to attend Larock Healthcare in Canton, OH in May. It was great to be the one to offer the scholarship to Robertha and after she heard the good news, she was overjoyed to be able to further her career in healthcare. Yesterday, I had the pleasure of speaking with Robertha to find out how her first week of classes have gone and what she has learned thus far. Robertha said that she has had a great experience this past week, especially because of her instructor. Dr. Barwick has been a nurse for 40 years and has brought her work experience to the classroom when teaching all of the 12 students in the class about hospice care and long term facilities. Well, I am so glad to hear that Robertha is gaining such useful knowledge to be able to easily pass the state exam after the end of the course. The scholarship team here at myCNAjobs is so excited to know that we are putting such dedicated and passionate caregivers like Robertha into CNA programs. The myCNAjobs team wishes Robertha the best of luck finishing up her CNA course at Larock Healthcare and on her state exam. We have all the confidence in the world that she will do great and will continue to be a great employee of Home Instead, her current place of work. Posted May 10, 2016 by chanelle & filed under Become a Caregiver or CNA, Caregiver CNA Duties, caregiver cna interview, Caregiver Job, Caregiver Job Tip, Caregiver Training, CNA Job, CNA School, Home Health Aide Job, Working as Caregiver CNA. Hi Everyone! It’s Chanelle again, here to fill you in about our newest scholarship recipient, Nancy D., and her experience at Arrowhead CNA Training of Payson. Arrowhead CNA had partnered with the myCNAjobs scholarship program last month to award Nancy an opportunity to become a certified nursing assistant. Arrowhead CNA Training of Payson awarded a full tuition scholarship to Nancy to attend their spring CNA class schedule. This week, I had the pleasure to catch up with Nancy to discuss how the program is going and she described the CNA program to be ‘one of the best things she’s ever done.’ She currently is attending the program’s night classes, along with 5 other students. Talk about some serious student and instructor interaction right? Nancy loves to be able to work with Janet, owner of Arrowhead CNA Training of Payson, so closely and be able to attend a class where the instructor is so passionate about teaching. Nancy mentioned, “Janet is amazing, she teaches us in ways to help us better understand what we are learning. She even incorporates games and videos to help us learn.” Nancy added that the most interesting thing that she has learned so far in the program is practicing taking blood pressure. Our main goal here at myCNAjobs is to provide a special individual the opportunity to change lives in the healthcare field. Nancy was awarded the CNA scholarship because she wanted to find a job that she would feel fulfillment with and be happy. At the moment, Nancy is working for Payson’s local Country Lane during the day, where she cares for the elderly. Then at night, she attends her clinical classes, there she gains experience with working with some mentally handicapped individuals. We know those are long days, but we are extremely proud and happy Nancy is getting so much experience with different patients! When finishing our phone call, Nancy expressed how thankful she is to be given the opportunity. Nancy said she would recommend Arrowhead CNA training to anyone that would like to become a CNA. In fact, she already told a few friends in the community about the myCNAjobs scholarship opportunity and Arrowhead CNA Training of Payson. We appreciate you spreading the word Nancy! As for now, here is Nancy sporting her myCNAjobs branded scrubs and be sure to check back with us soon on more news about the myCNAjobs scholarship program.